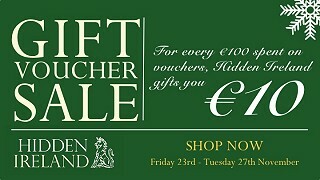 As a loyal follower Hidden Ireland offers you the opportunity to purchase vouchers in advance from Thursday November 27th. Any Vouchers purchased can be redeemed to book an overnight stay with dinner, a romantic break away or to celebrate a special birthday or family gathering at any of our Houses. With over 30 Houses to choose from throughout the island of Ireland, our Houses are located close to the country’s airports, Dublin, Dublin’s doorstep, along the Wild Atlantic Way,in Ireland’s Ancient East and Ireland’s Hidden Heartlands.